NanoCommons will deliver a sustainable and openly accessible nanoinformatics framework (knowledgebase and integrated computational tools, supported by expert advice, data interpretation and training), for assessment of the risks of NMs, their products and their formulations. NanoCommons combines Joint Research Activities to implement the nanoinformatics Knowledge Commons, Networking Activities to facilitate engagement with the research community, industry and regulators, and provision of funded Access to the nanoinformatics tools via funded calls for Transnational Access. NanoCommons will establish a single integrated resource for nanoinformatics data in which different stakeholders (e.g. scientists, regulators, NGOs, industries, etc.) can have confidence that it is both up-to-date and self-consistent. NanoCommons' positioning and how the project aims to provide an integrating platform for the NanoSafety community in Europe and globally. enable ‘safe-by-design’ approaches through QSAR & read across development coupled with ‘design of experiments’ tools to map NMs physicochemical descriptors linked with increased/reduced hazard profiles and exposure modelling. support regulatory decision making by ensuring data integration, enrichment and use for predictive modelling to assess “sameness”, allow read-across & implementation of real safe-by-design strategies. These advancements can only be achieved by the project’s unique partnership, each participant being selected for being at the top of the relevant R&D and networking activities internationally. NanoCommons is driven by the European nanosafety, nanomedicine and emerging materials research and regulatory communities need for an e-infrastructure providing a standardised, reproducible and interoperable way to access all available data, knowledge and analysis and modelling tools that have been adapted and verified as suitable for application to nanomaterials. More than 10 years of nanosafety research has delivered tangible insights into the key science and policy required for the development of safe nano-enabled products. However, this knowledge has yet to be systematised, or made “FAIR” (Findable, Accessible, Interoperate, and Reusable), in a manner that allows modellers to develop predictive frameworks and assess their domains of applicability, and allows industry to utilise the data, models and tools for safe-by-design strategies or as supporting evidence for use in regulatory dossiers, for regulators to compare one form to another or make estimations of data requirements for Novel and Emerging Materials (NEMs) based on shared properties with NMs, or for educators to utilise in teaching toxicology, ecotoxicology, environmental fate and modelling of the behaviour of NEMs. To address this gap, NanoCommons will create an openly accessible e-infrastructure serving the current and future (unmet) needs of the key research communities and pivotal industrial users and regulators. community building including bridging disciplinary gaps (e.g. toxicology and ecotoxicology, experimental and modelling), promoting best practice in data quality (e.g. Quality Assurance (QA) audits, Independent Experimental Data audits), and development of User case studies demonstrating the capability of the NanoCommons infrastructure to address real stakeholder challenges in partnership with industry & regulators (NA). 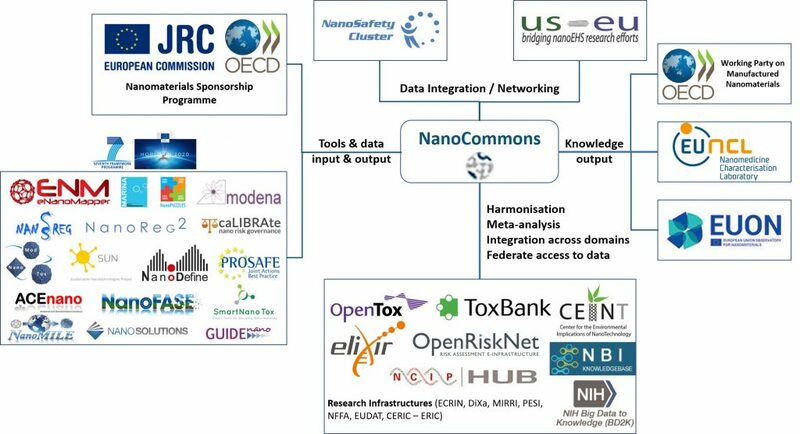 NanoCommons is designed to integrate the Knowledge infrastructure for risk assessment of novel and emerging materials on a European and international scale, and provide (remote) access to data, data mining, modelling and risk assessment tools to all European researchers, from academia and industry, as well as regulators, ensuring their optimal use and joint development. This will include a central “integrated from end-to-end” data capture platform (integration of on-line lab notebooks, use of electronic repositories for raw data etc.) with built-in quality assurance protocols (integration of protocols / Standard Operating Procedures (SOPs) / experimental instrument calibration (metrological services) and other QA aspects into data management workflow), to which EU and nationally funded projects can automatically upload, coupled with tools for automated integration of data from existing databases and data repositories, and for data enrichment, as well as creation and deployment of data dissemination mechanisms – e.g. web query, File Transfer Protocol (FTP) – also submitting appropriate data to international repositories and publishing data descriptors. 2. To provide funded and expert-supported Access to a range of data and modelling resources, knowledge management tools and nanoinformatics services integrated and developed via the JRA to the widest possible range of stakeholders across industry and SMEs, modellers, experimentalists, regulators and educators, including at the earliest stages of workflow (and lab) design and including guidance on data quality assurance including data audits and method assessment/evaluation. (TA). The data management services will offer tiered levels of data management – storage; curation & storage; curation, quality control, in-filling of missing values and storage; or storage, curation and access to data mining tools. Users will be able to opt-in anywhere along the data value chain. A key feature will be establishment of Virtual Research Environments (VREs) serving specific scenarios (research redesign, modelling and regulation). Activities here will include provision of a set of networking activities to increase interdisciplinary collaboration (e.g. Pilot Production, Safety, Regulation, Science, etc. ), to disseminate best practice, training activities aligned to the data management and nanoinformatics services (TA). It will also provide training on aspects such as independent experimental data audits and Quality Assurance audits which aim at eliminating disorganised sample storage, inadequate data logging, variable experiments, unsecured data analysis, and missed maintenance records. A key focus will be on ensuring that data management is integrated into the data generation workflow (e.g. using e-lab-notebooks and other online data capture platforms).